Area 235 A. 0 R. 16 P.
Michael Cottingham Michael Cottingham Private dwelling with 2 rooms. Bridget Kain Bridget Kain Private dwelling with 1 rooms. Bridget Hynes Bridget Hynes Private dwelling with 2 rooms. John Cavanagh John Cavanagh Private dwelling with 2 rooms. Martin Bourke Martin Bourke Private dwelling with 1 rooms. Michael Sweeney Michael Sweeney Private dwelling with 2 rooms. Patrick Geoghegan Patrick Geoghegan Private dwelling with 2 rooms. Thomas Harte Thomas Harte Private dwelling with 2 rooms. Patrick Foy Patrick Foy Private dwelling with 1 rooms. Catherine Newell Catherine Newell Private dwelling with 5 rooms. – Catherine Newell Private dwelling with – rooms. – – Kilroe Nat.Sch with – rooms. – Thomas Garvey Private dwelling with – rooms. Click on the Griffiths Valuation Page # 161 to see a list of tenants with plot numbers to match the Griffith map. The map has each renters plot numbered and recorded in the Valuation book so the exact location of your ancestors plot can be ascertained. 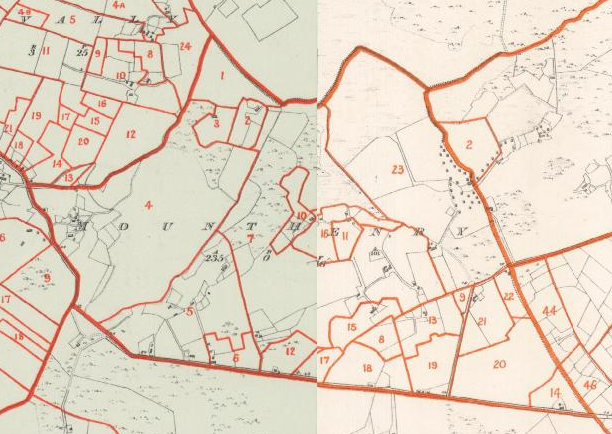 Click on the Griffiths Valuation Ballinrobe Page # 161 to see a list of tenants with plot numbers to match the Griffith map. Situated in the south side of the parish. It is bounded on the N. by the td. of Glasvally E. by tds. of Cloghmoyne and Ballisnahyny; S. by Gortbrack ; and W.. by Ballycurrin td. It contains 235a. Or 16p.,.and is the property, of captain Lynch, Ballycurrin House . It is let to tenants at will, in farms of from 5 to 12 acres, at the yearly rent of from 18s. to 20s. per Irish acre. There is a great deal of rocky and boggy land, for which the tenants also pay. The tenants are all Catholics. There is a Roman Catholic Chapel on the boundary between this td. and Cloghmoyne td.